Description: A memorial plaza has a monument, flagpoles and benches. The monument is inscribed: "In Honor Of Those Who Served Our Country" and has the emblems of the Army, Navy, Air Force, Marines, and Coast Guard. The benches are inscribed: "Freedom To Worship", "Freedom From Fear", "Freedom From Want", and "Freedom of Speech". 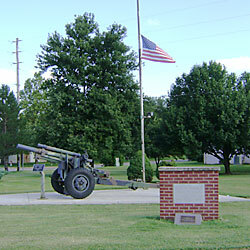 Description: The veterans memorial contains a brick and granite monument, an M101A1 Light Towed Howitzer, and a flagpole. 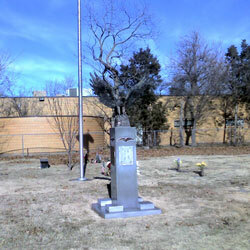 The monument is inscribed: "Veteran Memorial ~ American Legion ~ Post 295 ~ May 30, 1955". At the base of the monument is a bronze plaque which reads: "In honor of ~ those who served". 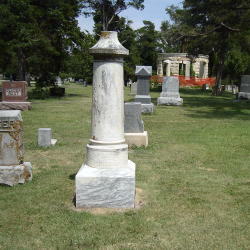 Description: A small granite marker is associated with the cemetery map. It appears that the original location is being rebuilt as there are the remains of a plaza and flagpole near the present location. The marker is inscribed: "To Those Who Served ~ Our Country ~ "They Gave Their Today ~ For Our Tomorrow ~ Erected May 1, 1968 By Ark Valley V.F.W. ~ Ladies Auxiliary Post 3371". 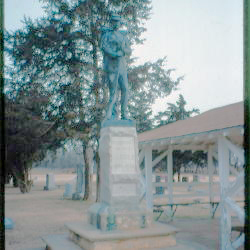 Description: Photographs from 1997 show a bronze soldier at parade rest on a square granite column. The inscription on the column reads: "In Honor ~ Of Our ~ Heroes ~ 1861-1865" and "Loyalty". The reverse side of the column is inscribed: "Erected ~ By ~ S.A. Gilbert ~ Corps ~ 1922" and "Lest We ~ Forget". 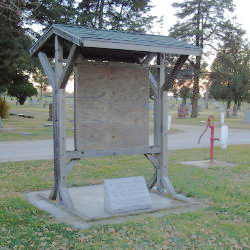 Photographs from 2006 show the Monument moved inside the wooden shelter and the soldier missing. The soldier has been moved to the Mount Hope Museum. Description: A 32-pdr Navy gun of 57 cwt is mounted on and between two sets of stacked limestone blocks. The upper surface of south stack of blocks is inscribed: "G.A.R.". The north stack is inscribed: "No. ~ 244". Cannon balls sit on four corner concrete pillars. 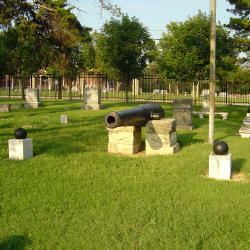 The monument behind the cannon is inscribed on both sides. The inscriptions read: "Memorial ~ By The Ladies Of The ~ Grand Army Of The Republic ~ Caroline Harrison Circle ~ No. 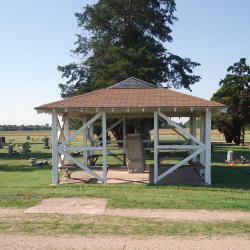 56 ~ Organized ~ July 21, 1893 ~ Dedicated ~ May 5, 1921" and "Memorial ~ Eggleston Post ~ G.A.R.". 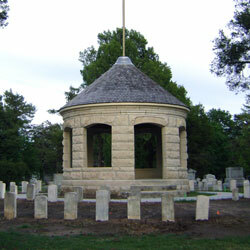 Description: A pavilion is constructed of granite with four figures, representing the four branches of the services mounted on each of the four sides. A central column in the shape of an architectural dome constitutes the roof of the pavilion. 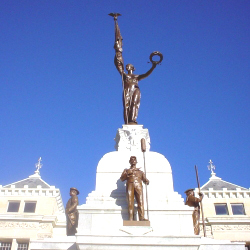 A figure of Victory, holding a flag and an olive wreath surmounts the dome. 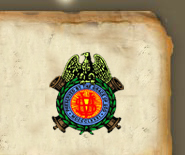 Inscriptions on the pavilion read: "Grand Army of the Republic ~ Fraternity Charity Loyalty". "Erected A.D. 1912 by the People of Sedgwick County, Kansas ~ In Memory of the Union Soldiers and Sailors of the Civil War". "If Any Man Attempts To Haul Down The American Flag, Shoot Him On The Spot - John A. Dix". "The Union Is Perpetual - Abraham Lincoln ~ Let Us Have Peace - General Grant". 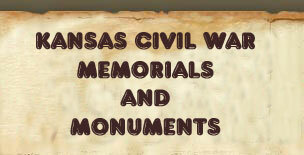 "The Sedgwick County Soldiers And Sailors Civil War Monument~ Built 1912 - 1913 ~ Has Been Placed On The National Register Of Historic Places By The National Park Service, United Statues Department Of The Interior, November 1998". "To The Memory Of Our Unknown Dead ~ Asleep Unclaimed Til God Claims His Own". The rear mantel is inscribed: "WRC ~ Memorium ~ To Our Fallen Heroes". This pavilion has been completely restored. "Ladies of ~ G.A.R. C.H. ~ Circle 56". "Members of Circle 56 ~ Josephine Allen ~ Belinda Giddings ~ H.J. Hambrick". "Veterans ~ David Preston ~ Jonas M Triplet ~ David Hockett". "Son of a Vet ~ Alphonzo T Marion ~ Dau of a Vet ~ Amanda Hart ~ Dau of a Vet ~ Winnie Pratt". 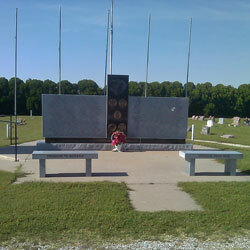 Description: This structure is the centerpiece of a large park with numerous monuments dedicated to Veterans. The flagpoles in this plaza are labeled with specific historic flags. 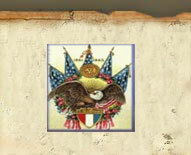 These include the Thirty Four Star Flag (used at the initiation of the Civil War). 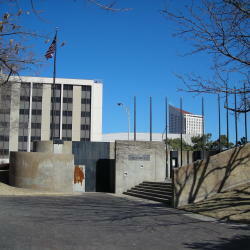 The identification plate at the entry to this plaza reads: "John S. Stevens ~ Veterans Memorial Park", "Dedicated November 11, 1977". 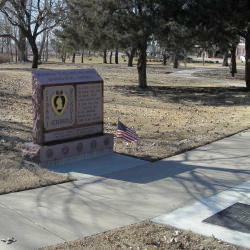 There is a granite monument to the Military Order of the Purple Heart at another location in the park. The inscriptions on this monument read: "Dedicated To All Men And Women ~ Wounded In All Our Wars", "My Stone Is Red For ~ The Blood They Shed.~ The Medal I Bear ~ Is My Country's Way ~ To Show They Care. If I Could Be Seen ~ By All Mankind ~ Maybe Peace Will ~ Come In My Lifetime." "Erected By Richard E Cowan Chapter #558 ~ Military Order Of The Purple Heart". 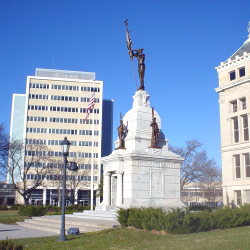 Description: A granite monument with eagle sculpture is mounted in front of a flagpole. The bronze plaque on the memorial is inscribed: "Dedicated ~ to the ~ men and women ~ who by their ~ unselfish patriotism ~ have advanced ~ the ~ American ideals ~ of ~ Liberty".